New Delhi: The Indian economy has regained its momentum, with the Central Statistical Office (CSO) reporting a GDP growth of 7.2% in the December quarter (Q3) of 2017-18—the fastest in five quarters. This recovery was sparked by a revival in investment demand, registering a growth of 12%. Based on Q3 GDP data, the full year’s growth has been revised upwards to 6.6%. If this GDP growth rate is realized, the size of the Indian economy is projected to grow to $2.6 trillion at the end of March. 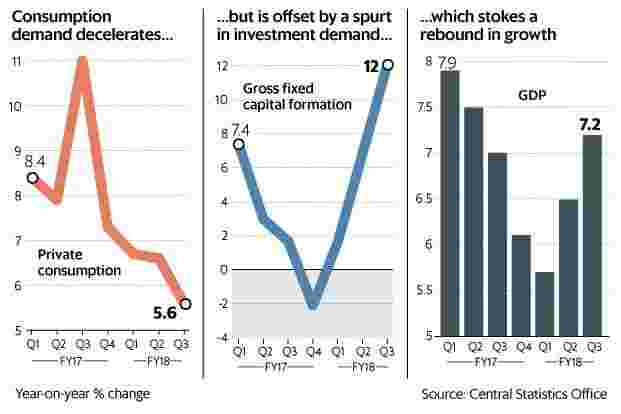 Not only does this signal that the Indian economy is tiding over the disruptions—triggered by demonetisation of high-value currencies and rollout of the goods and services tax—but the latest quarterly corporate earnings data suggest that consumer demand too is reviving. To achieve the 6.6% growth projection of the second advanced estimate, the Indian economy will have to grow at 7.1% in the last quarter, as against a growth of 6.5% in Q2 and 5.7% in Q1. The Indian economy had expanded by 7.1% in 2016-17, 8.2% in 2015-16 and 7.4% in 2014-15. The CSO had in its January projections estimated that the economy will grow at 6.5% in 2017-18 but has now marginally revised it upwards, though it is still lower than the 6.75% estimated by the Economic Survey. In the quarter, economic activity picked up across sectors, with the exception of mining and quarrying, data released by CSO showed. Significantly, gross fixed capital formation—an indicator of investment demand in the economy—also registered a sharp increase of 12%. Private final consumption expenditure grew at 5.6% while government final consumption expenditure was up at 6.1%. To be sure, a part of the acceleration can be attributed to the base effect. India cancelled the legal tender of high value notes on 8 November 2016 leading to widespread disruption in economic activity. Madan Sabnavis, chief economist at Care Ratings, said the Indian economy should grow gradually to 7.5% in 2018-19. “Manufacturing has benefited in the third quarter from the restocking exercise post demonetization which is also evident in the IIP growth numbers which should be maintained," he said in a note adding that the pickup in activity across sectors, supported by private consumption and gradual revival in investment could push India into the high growth trajectory. In the quarter, agriculture grew at 4.1%, manufacturing at 8.1%, construction at 6.8%, trade, hotels, transport communication and services related to broadcasting at 9% and electricity, gas water supply & other utility services at 6.1%. The finance ministry said in a statement that the robust growth in manufacturing and significant acceleration in construction mark a turnaround in the country’s economic growth momentum. For the full year, gross value added (GVA) is expected to grow at 6.4% as against 7.1% in the year ago period. Agriculture will grow at 3%, manufacturing at 5.1%, trade, hotels and restaurants at 8.3% and construction at 4.3%. But given that government spending has driven economic growth, the rising fiscal deficit numbers could prove to be a constraint. Chandrajit Banerjee, director general, Confederation of Indian Industry (CII), said the Q3 GDP numbers strengthens the perception that the Indian economy is on the threshold of a sustained rebound. Separately, data released by the controller general of accounts, India’s fiscal deficit as of January end was at 113.7% of the revised estimates.